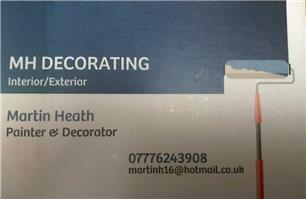 I am Martin Heath, I have recently established MH DECORATING since branching out on my own. I am fully insured and have been now for 10+ years. I undertake all aspects of work such as interior, exterior, domestic and commercial. I am proud of all my work from the moment I arrive to the moment I leave and I aim to go that extra mile for the customer. I offer a free quote where I will inspect the work and give you my advice on anything you’re unsure on and then later a written quote where its then up to you if you would like to use my services. Please feel free to give me a call and I’m sure I can help you out.